I told him that we were standing in line with the 91.7% of the folks who are employed, not the 8.3% who are unemployed (U-3 unemployment measure). I should have told him that we were standing in line with the 85.2% of folks who are fully employed, as opposed to the 14.8% who are not (U-6 unemployment measure). 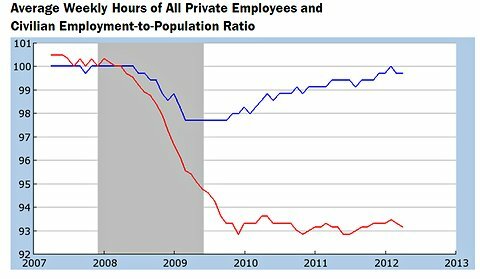 The blue line shows the average number of hours worked by people with jobs in the private sector. It shows that those of us who are working are doing fine. The red line in the chart below is a monthly index of the employment-to-population ratio, normalized to a value of 100 in December 2007, when the recession began. The lack of an uptick in the redline since 2009 is, we think, the essential tale. Regardless of how one chooses to explain it, the fact that it has not improved is the critical issue. Sobering fact: Long term unemployment, defined to be 27 weeks or more out of work climbed to 5.4 million, or 41.3% of unemployed(U3) people. This entry was posted on Tuesday, June 5th, 2012 at 11:26 am and is filed under Front Office. You can follow any responses to this entry through the RSS 2.0 feed. You can leave a response, or trackback from your own site.